I see all the time people crowing about DIY finances. Just buy low cost index funds they cry! Financial advice? What a rip off!, Why I can buy VTSAX for 4 bp… And that is true. It is cheap, but is it wise? Why studies have shown you can’t beat the market… But those studies are generally compared against actively traded funds a worst case comparison. What about passive factor based funds? Why those AUM guys just want to pump and dump for 1% of your money… It’s hard to find a 1% AUM Financial Adviser most are 0.5% and under. The ones that use 1%, use 1% to weed out clients with small assets. Crowdfunding, by gosh I believe in crowdfunding gonna make a mint… Plenty of articles out there decrying crowdfund risk. Taxes ya I know all about taxes… Do you really? I read article after article saying the “average retail investor” under performs the S&P by greater than 4%. Another one I read says 3% performance for the DIY crowd over the last decade is average. So if you can get a FA to help you get an additional 500bp return is it worth paying him 10% of that? In my investing life there have been dramatic changes. I started trading commodities in 1975, the same year Vanguard was invented. Vanguard was loathed, hated and ridiculed in investing land. Back then you bought actively managed funds with front end loads typically 5.5%. Fidelity was cheap at 3%. You bought actively managed funds because everybody knew Peter Lynch of Fidelity Magellan was a maven, and he was! He consistently returned an average yearly 29% return, twice the S&P 500! (according to the advertising) You needed twice the S&P to make up for the 3% loads and fee structure! In 1975 there was no internet PC’s to speak of (I had some computers I built and programmed but primitive primitive. My memory storage medium was a stereo cassette tape deck and my monitor was an old TV.) You made trades over the phone and got market data from the news paper. If you bought and sold a stock it cost $400 for a round trip. IRA’s were initiated in 1975 and had a $1500 contribution limit. Brokerages and brokers got rich not their clients. This is where the prejudice of the “rip off FA” started. I was a two for you, one, two, three for me kind of deal. It felt like a rip off but at 29% a year it was better than a passbook acct which might pay prime at best. Magellan by my calc has returned 5.5% over 38 years and lost it’s way after the dot com bust. Understanding a bit about the history of the financial services industry is important because financial services are all about sales and hype. Even Vanguard is hype else wise they would just have a bond fund and a stock fund, so no matter what you’re buying hype. Money magazine was hype, Kipplingers was hype it all was hype. In ’92 I was listening to Alan Greenspan on CNBC in the surgical lounge and someone asked him “what would you invest in?” and he said I would invest in the whole market. I never heard that before and it was entirely different than what I had been taught by the hype. He obviously was a student of Harry Markowitz and understood diversity. ’92 was the age of Compaq MSFT, Dell and Cisco. One of the Internists bought Cisco and turned it into 10M in about 5 years. He later got Alzheimer’s and it didn’t do him much good. The Greenspan comment started me on a journey to understand this different kind of “own everything” investing. Own everything investing was Vanguards claim to fame and legitimacy, that and the .com bust. After that people started looking for rationality. People won Bigley in .com gambling, investing in smoke and lost even more Bigley. I was day trading in those days but I also had a diversified investment account side by side with my speculative trading account. I made money trading but it was a heck of a lot of work and a lot of stress. 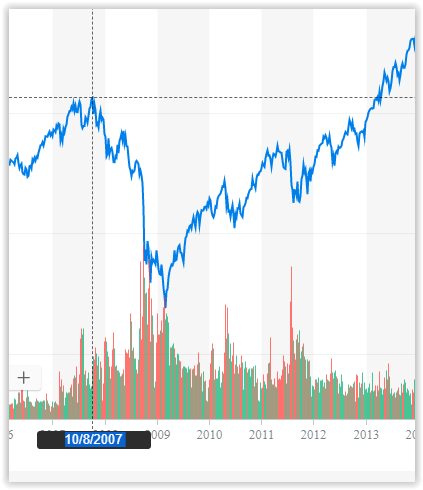 After GE peaked at $60 in 2000 and was $20 in 2003, I understood my exuberance was irrational and I decided to give uncle Alan’s approach a try and plowed 1M into SPY in April of 2003. I liquidated all of my losers and collected the LT cap loss and this 1M was my remaining cash. It wasn’t all of my portfolio, but it was a chance to buy low. It was the beginning of Gulf war 2 and the market was in the toilet and I asked myself should I vote for or against the US. I was in the Navy during Gulf war 1 and decided FOR. Right decision. Along about this time I decided I wanted some professional help, no not mental health but investing. I was in B&N and a book by Phil DeMuth and Ben Stein caught my eye so I bought it. It was all about the efficient frontier and how to invest effectively. I read a few other books by these jokers. One day I called up Phil and we talked and I sent him 1M to start with the promise to send more if I liked what he did for me. 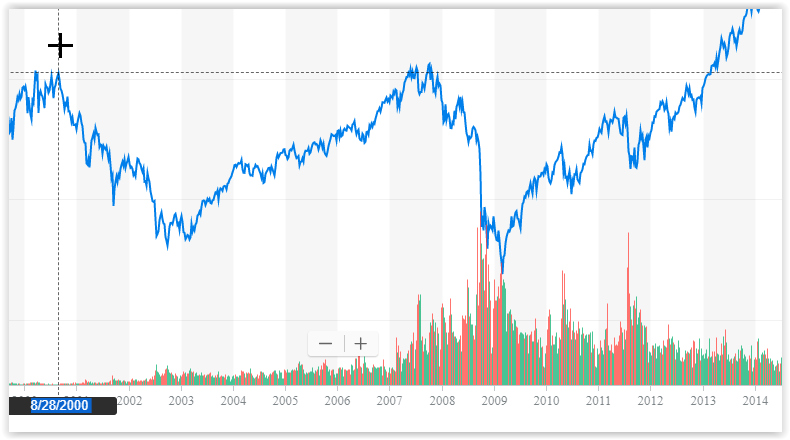 Shortly there after 2008 happened, but it allowed me to compare efficiently risked money with my SPY kind of money and watch the rates of recovery. Phil’s style won. The other advantage is being involved with a manager made me invest correctly all the time and on time. I still had cash not invested but it was cash I intended to not have invested not the result of indecision or poor choices. I also had access to investment grade funds as opposed to retail funds which were based on Fama-French tilts. In those days FF tilts paid a premium at very low cost. Over 100+bp/yr compared to an extra 10 bp differential between Vanguard and the tilted funds. I’ll take an extra 1+% any day. That difference has since been arbitraged away IMHO but it was nice while it lasted. Phil also streamlined my taxes and tax loss harvested for me. By retirement I had about 600K of tax loss harvest (TLH) accumulated. TLH is like free money. Phil’s software kept track of tax lots and their basis so I was always trading at max efficiency when I did trade or make a AA change. When we would strategize a change I would get a complete analysis of what it was going to cost and it was easy to do cost benefit analysis. When it came time to Roth convert I used 120K of the 600K TLH to scare up some cash to live on and to pay Roth conversion taxes. That money came out of my post tax account tax free. I also use that TLH money against cap gains on my post tax money come tax time. Knocks hell out of my tax bill. Phil also sent me journal articles on topics like SORR and AA peri-retirement so my understanding of risk was much enhanced and it prompted me to do my own research. We’ve concocted a good solid Roth conversion plan, highly efficient. I’ve done most the work, he is my error check and I have access to his software to “what if” scenarios and he always adds a little twist to the analysis I didn’t think of. I take the little twist and run with it and optimize it. I’ve written my own spreadsheets but it’s nice to know professional grade software shows close agreement on my conclusions and have a professional looking over your shoulder. 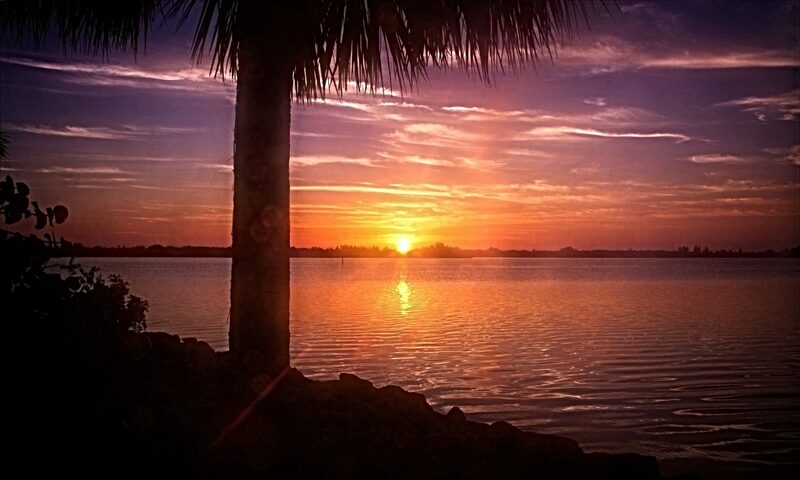 My post retirement is set up to maximally optimize my tax picture. My tax savings are in the hundreds of thousands over decades. My Roth conversion provides exactly the portfolio safety I desire. My portfolio is sub-divided into cash, LT cap loss, ST cap loss (small amount), Post tax brokerage, TIRA, Roth IRA and my Home. My portfolio is quite a bit larger that my 30 year need so I can convert the Roth money into something of a self insurance account. As I age and my wife ages eventually we will incur medical expense estimated at 300K per person from age 65 to death. There are may things Medicare does not cover like assisted living or 24/7 memory care. The Roth will be filled and then not touched as insurance against catastrophe. 1M in 10 years will be 1.8M, in 20 years will be 3.2M (my age 85) and 6.4M by my wife’s age 90 (she’s a lot younger), so plenty of money against catastrophe, or if we both drive into a bridge at a high rate of speed my kids will be ecstatic. Either way the Roth has a job to do and it’s to protect our security, not to fund our cash flow. I will get my daily hamburgers from other assets like SS some TIRA RMD, and post tax brokerage money mixed with TLH. My situation is a bit complex and my wife has interest in the plan and can follow the arguments but does not eat and sleep it like me. Phil acts as protection in the case of my demise. The plan is the plan and will be executed and she can turn to Phil for guidance. One kid is out of college and on her own and the other is 2 years away from fini so that whole Curly shuffle is winding down. I pay nothing like 1% for this security, I won’t say how much except it’s way less. It’s money well spent. I’ve made far more in streamlined returns in the last 10 years than 20 years of professional financial advice will cost me. You may think DIY is wise but if you loose in the end because of ignorance, arrogance, simple mindedness, bad risk analysis or abject stupidity based on internet boilerplate it will cost you far more. Investing is not about a dopamine induced fog but clarity of purpose and risk management. The other thing is implementing a plan like this takes time and it takes staging in the accumulation phase in what I call epochs. Epochs occur over years to decades. If you fund your retirement’s self insurance 40 years out, most of that will be in place as interest by the time you retire. You could call that the retirement insurance epoch. You already fund a 529 and rely on the interest to carry that through, you could call that the college expense epoch. Just think of it like that. Do not be mesmerized by the necessity of pre-tax money the restrictions are often more costly than the benefit. So I physically started Roth conversion this week. I have enough information to know the majority of my post tax distributions for the year, not exactly but close. Should only be about 8K unqualified. The unqualified is taxed as ordinary income and qualified as cap gain. I will pay taxes on unqualified and write off my cap gains against my LT cap loss for zero tax on that aspect of my tax life. So I have about 8K ordinary income to worry about off the top. My first conversion is my wife’s IRA’s in entirety. It’s about 140K. She has 24K in post tax basis mixed in that money, so by working through the calculations in form 8606 her taxable income is reduced to about 115K, for a 140K conversion. Therefore I’m up to about 123K (115 + 8) in taxable income for 2018. The reason I closed her out first was because of the write off on her account. It gets the maximum amount of money into her Roth to commence compounding. My net tax saving for this move is 5K. This will close out her remaining experience in Roth conversion as all of her money will be tax free in a Roth. My next conversion will be my own and I will convert something like 125K and I may go a bit higher as my tax picture becomes clearer. I chose $250K as a max conversion instead of the top of the 24% because it avoids the 3.8% medicare surtax on amounts above $250K and avoids higher medicare monthly premiums, and generates 22K less in taxes (88K over 4 years saved), while over 4 years I will converting about 2/3 of our TIRA. The other 1/3 I will leave in bonds and go ahead and RMD that amount at 70 and use that money to buy hamburgers. My conversion factor on 125K is 97.9% taxable because of my post tax money in there So on a 125K conversion only 122,375 will be part of my AGI. My taxable AGI therefore will be 115K + 122K +8K or 245K with a 5 K safety factor since you can’t re-characterize Roth conversion anymore. My net conversion will be 140K + 125K or 265K into the Roth and I will reinvest the 8K back into my taxable account. My tax bill for that conversion will be $41307 for a 265K conversion for an effective 15.6% tax rate. I’ll send the IRS the 2018 money and we will be cool. Had I converted 341K my effective tax rate would be over 19%. My move in January 2019 will be to convert another 245K AGI. With the conversion factor of 97.9% I will be able to convert $250K actual money from the Roth for a 2 year conversion of $515K, over half of my estimated conversion amount. My tax bill on that $245K is also $41,307 and I will send the IRS the money in January and we will be cool for FY 2019. So by start 2020 @ 4% my 515K investment should be worth almost 536K. I’ll do it again (250K, 245K taxable) in FY 2020 and be up to 814K in the Roth at 4%. Finally in FY 2021 I’ll add the last ($250K, 245K taxable) bringing our Roth’s to 1.1M with a tax bill of 165,228 or a 15% tax bite. I’ll leave the rest of the TIRA to grow ever time as I withdraw and should have about 600K left in TIRA @3% return over 4 years. $600K will RMD $22K the first year and will grow to $28K the 10th year and $32K by the 20th year. The TIRA at my age 90 will still have $340K available in funds just in case. Every withdrawal from the TIRA going forward will use that 97.9% conversion in calculating the AGI, so $22K RMD is only $21.5K in AGI. Every $500 helps. I will supplement my income by selling taxable stocks and using my LT cap loss. As SS grows and RMD grows my “need” to access money from the post tax account to make budget diminishes, or I can slice off a little more from the post tax money roast and buy the ol’ lady a new car. The Roth remains untouched. It will transfer wealth to my kids or be available as insurance in case of medical disaster. At 5% it’s estimated worth will be 3M at my age 90. People write accumulation investment plans. This is my deflation plan. It tells me my need based on my assets. It directly informed my accumulation phase plan. It actually shows I worked too long but I didn’t hate my work life at all. One day I realized every day I went to work all I was earning is more risk since I already made all the money. My accumulation was determined by going to SSA.gov and adding up my lifelong earnings using medicare wages. From that I could easily calculate a reasonable average cost of living as an estimate. I paid medicare wages for 49 years and was always employed in some fashion. From those medicare wages, I paid for 2 adoptions, 2 college educations for my kids, bought 2 houses sold one, bought a dozen cars, started a family. I never had debt except the mortgage which was tax advantaged. I also funded a portfolio over 43 years. My portfolio was almost twice my medicare wages and probably 2/3 of it was accrued interest. This means my portfolio could support about 2 retirements. The earlier you retire and with less, your portfolio’s survival at some point becomes leveraged to a rate of return. The earlier you retire and on lesser money your leverage increases. Thinking of your future in terms of leverage I think is useful when it comes to planning because leverage is what drives you crazy, and your brain is hard wired to be risk averse. It’s also what causes you to fail. It’s hard to live in peace with too much leverage hanging over your head. I never used a 4 x 25 kind of calculation to determine the future probability. Instead I beat the hell out of it with a Math hammer which is my nature. Took over a year to figure this out and optimize it to where I am happy with it. Hopefully some insight can be gained as you make a plan germane to your situation. Deflation has a lot of moving parts, and no W2 protection, but adequately funded retirement with no side gigs and all that hassle is glorious. I took a 2 hour nap in the sun in my sun room today and even though unconscious I enjoyed every minute of the sensation of warm sunshine on me. The I got up, took a leak and wrote this screed. I recommend! I woke up this morning thinking about activity. Activity is the thermodynamic concept of non standard behavior in a chemical solution. As solutions become concentrated the A + B =AB relationship become x*A + y*B = z*AB where xyz are a kind of fudge factor which describes real behavior instead pristine theoretical behavior in chemical solutions. The variability is due to how charge, solubility and entropy changes local environments for molecules instead of just viewing their behavior in a dilute solution. The local matters in the real world. Blood is an aggregate of hemoglobin contained in corpuscles and a kind of dirty proteinacious water called plasma. The hemoglobin is highly soluble to O2. You can stuff a whole lot of O2 into hemoglobin especially hemoglobin contained in corpuscles, but not so much in plasma or free hemoglobin in solution. Your cells crave ATP and the ONLY way to efficiently make ATP is to deliver enough O2 to the cell mitochondria. Not enough O2 = RIP. So life itself depends on this method of hemoglobin aggregation. Dis-aggregate the hemoglobin, and even though the amount remains the same the effective O2 delivery is so poor you will die. I was reviewing the nature of VTI. VTI is a total stock market tracking ETF. People own VTI as a proxy for owning all the stocks in the US market. It is commonly published there is some comfort that “all the stocks” are “more diversified” and therefore “safer”. Actually the majority of diversity is achieved in as little as 20 stocks. 1000 stocks only provides 5% more diversity. VTI as a tracking vehicle has as its portfolio 1560 stocks. The total us market has a bit over 3800 stocks, so VTI is only 41% of “total stock market”. Ya Ya blablabla so what? Well the point of activity was to account for the non standard behavior of solution with high concentration. Index funds make up 29% of the market. That’s called an aggregate and I would call that a high concentration. The behavior IMHO is not random but actually quite concentrated, and the measuring tool is just an estimate. The “tracking fund” just estimates the actual total market. In normal times it estimates beyond good enough. But what about abnormal times? The point of owning index funds is the so called safety of diversity. If you sell VTI and Vanguard doesn’t have cash on hand it will have to sell 1560 stocks to raise the cash to pay you. This causes a distortion in the tracking. There is now downward momentum on those 1560 stocks in excess of normal market swing. Remember you actually own VTI not the total market, so the value of your portfolio is the actual price of VTI not the price of the total market. Now what if half of the 29% who owns the “index stocks” sell. What happens to balance of the the index? What happens to the value of your portfolio? My impression is xyz kicks in and all of the “formula” which rely on say “8% long term market gain” goes out the window as momentum forces dynamic distortion onto the system, and the distortion will be worst in those 1560 stocks you own since those are the ones being most sold at fire sale prices. The robots don’t care. You give them a sell order, they sell sell sell, damn the torpedoes. I wrote a post ‘on Creative Destruction as the Motor that propels the American economy, and so it is. There is another Motor that propels the individual’s financial reality and that’s work. In my recent post on journaling your family financial history, you might also journal your own history. If you’re honest with yourself, it will reveal your own relationship with money and work. That analysis can be invaluable. I grew up on the south side of Chicago in the 50’s, a neighborhood kid, Catholic school and all of that. Down the block was a little park where we played baseball and football. One one end of the field they had scooped out a little area a few inches deep, when they graded the park, next to the fire hydrant. In the winter once the ground froze they would turn on the hydrant and we had instant Hockey! I thought what a cool concept, just add water! In the spring the field would dry out and it was time for baseball again, hey batta hey batta hey batta SWING! I moved from Chi to a tiny town in southern Indiana when I was about 10 or 11. It was a totally different smoke than Chi had been. The kids had been there for generations and somewhat clicky and the Ethos had more in common with Alabama than Chi. There was a kid in my new neighborhood that had a paper route and he was moving, so I got the paper route, and at age 11 I was in business for myself. It was real business. The paper charged 35 cents a week which I had to go collect. The papers were delivered to a small market 1 mile away. On Thursday the paper was double in weight because of flyers. On Sunday it was a regular Sunday paper with half a dozen sections adds etc. The paper and I split 20 cents/15 cents BUT if I didn’t collect because some prick wouldn’t pay I lost 35 cents because I still had to pay for the paper. I collected on Friday and it was funny how people were home every other day, in fact tapping their watches if I showed up 15 minutes late, but on Friday their place was a mausoleum. In college I usually had 2 jobs. I was a janitor, a chemistry research asst., I had a pizza delivery gig on Sat and Sun complete with a free pizza so papa ate good on Sat and Sun! The pizza gig was for cash. I also tutored physics math and chemistry on the side. Eventually I went to grad school and became a teaching asst and had a rock and roll band on the side. I left academia and became an engineer and got a gig teaching electronics at a community college on the side. I also had a consulting business and was eat up with learning commodities trading. Circumstance had it I ended up getting accepted to med school. My first 2 years I had a gig teaching MCAT review to pre-meds and eventually ran out of tuition money so I joined the Navy as interest rates on loans were 18% immediate accrual. Homey don’t play that. Went in the Navy after residency and did moonlighting on the side, and paid off my commitment. My first gig post Navy was Locums, traveling around so I could figure out how practices worked and the pathology involved. I found a model I liked, Fee for Service Private Practice Solo and found a hospital in an area with a great payer mix and went to work passing gas, saving lives and winning valuable prizes! I also started a pain practice on the side. I learned how to do pain in the Navy. Later we formed a group at that hospital and even later we started a SDSC. By then I was old so I retired. I stuffed money in some market since age 25. I never had debt except for a mortgage which is proper use of leverage, instead I had work and lived within my means. I worked hard but never bled my eyes out and my work made me wealthy and wise. Healthy? Like Joe Walsh says: Some say I’m crazy but I have a good time, I’m just lookin’ for clues at the scene of the crime. Life’s been good to me so far..
That’s my motor story. None of it is about money. It’s about taking advantage of the opportunity that presented. Journal Your Family’s Financial History. My colleague Doc G has written about his financial pedigree. He claims 3rd gen FI! Your attitude toward money comes out of your family at a very basic level, like at a breathing air kind of basic. There is probably a lot that is sorta known in the broader family about Finance, like Alcoholism or Robbery is sorta known. It’s not something really dwelt upon and kind of ignored if it’s not in your face or kicking your patootie. His bravery at posting got me to thinking about my own financial family history. So I sat down and journeled me up a far reaching family financial history going back 4 generations as far as I knew, about back to great grand parents who lived in the late 1800’s. There was a family farm back then for some aspect of the family, and all the uncles and aunts would gather at the farm for reunion! and the women would bake pie and Blatz beer and Pabst Blue Ribbon drinkin men would get out the 10Ga shotgun and laugh as we pip squeak kids would set off a blast toward the sky and get kicked like hell in the shoulder. That 10G was no joke! Rite of passage. The farm smelled of manure. I’m not exactly sure where it was located, somewhere south of Gary IN. My grandparents were born at the turn of the 20th century. If you trace it, their jobs, their education, their success at raising a family in the face of things like WW1 and WW2, Korea, Viet Nam (reached into my generation) and the great depression, and various layoffs, unions. rotten offspring, successful cousins etc you have lain before you an understanding of the American economy for a century or more and how your personal family dealt with making it in America. You understand the constraints of retirement. Did Grandpa have a retirement? If so what was he invested in? (a way to understand risk). Did he advance at work? Was he a Union man? How did he survive the great depression? What did his kids (your aunts and uncles) wind up doing? What was their retirement like? Did they save? What about cousins? What about cousins’ kids? All of these people somehow survived with a real story, not just a blogosphere projection. A real story that is the life you lived the financial air you breathed as a youngster. From that you can also look at your relationship with money under that light and see what insight that provides. It’s actually fascinating. A quick example: My Dad was an engineer. A professional engineer which means he was like board certified and could stamp jobs as sound design from an engineering perspective. A valuable credential. It means a project can get financed and insured. Prior to certification he was subject to getting laid off. Engineers are in high demand in the good times but dead weight in the recession. So that was my story, living in the house of an engineer with 4 kids who got laid off every so often and required a job change and possibly a move. My Dad lived through 6 moves in his career. The 7th was his retirement move to my town where he could be near me and watch his grand kids grow along with my Mom, who is still alive. He knew I would take care of Mom if anything happened, the ultimate in risk management, so I’m familiar with the finances and have seen how my Dad handled those. He was a star. My Dad handled my Nana’s finances once gramps died and he also handled my Aunt (gramps sis) who had no kids but was married to an entrepreneur back in the 40’s and semi retired to FL in the 50’s. The guy was hell on wheels on the organ. I was very familiar with those financial histories and their successes and relative failures. (Word to the wise a CD ladder is a poor investment strategy in a 1973 stagflation, and 1980 raging inflation environment). I discovered much more, likely too personal to relate, but the point is the point. You are sitting on a treasure trove of personal insight and righteous systems analysis if you bother to look. If you bother to look, Suze O won’t have anything on you. You will have personal history of success and failure far beyond some 4 x25 blog snot. Have you ever wondered where the advancement of your wealth comes from in an equity? In a bond it comes from the coupon rate. In a $1000 bond with a 5% coupon, your wealth advances $50/yr. This is actual interest and can be reinvested for compounding or used for spending. A Bond therefore is a kind of legal contract offering you a money motor called cash flow. A stock OTOH is a piece of property. It’s ownership and it’s value is indeterminate. For example more stock can be created or some can be bought back. It’s only worth what someone will pay you for it. If you own 1000 shares of BRK.B you own a percentage of BRK.B. You can trade your BRK.B for money but until you do that you just own some property, same as a house or a farm or a car. So what makes a stock valuable? We glibly buy stocks and quack about the “magic of compounding”, but on it’s own property does not compound. On any given day it can be worth more or worth less or even become worthless. What’s the motor for a stock? Henry Bessemer patented a process for making steel in 1856. The process made steel purer stronger and easier. The process existed in other parts of the world (cold blast) since the 11th century. The story is an intriguing look into creativity and mythology and perhaps a dollop of theft, but none the less the blast furnace method of steel production ensued. This new steel compared to cast iron lasted 10 times longer, was malleable and could be produced in vast quantities. Bessemer’s process brought down the price and improved the quality. Because of Bessemer’s process Minnesota’s Mesabi range of Iron Ore went from a 6% of need output to 51% and steel workers went to work making steel (imagine all those jobs and lives changed). Cheaper steel allowed rail roads to prosper. A rail was cheaper to make and lasted 10x longer. At one point Chicago was the cross road for 14% of the nations railways. My Grandfather had a second grade education and worked the steel mills in south Chicago his whole life. He raised 6 kids. They were poor but Henry Bessemer’s innovation fed them. My other Grandfather had an 8th grade education. He became a meat buyer for A&P foods. Eventually he worked his way to the C suite as VP. I used to tag along to the Chicago stock yards where gramps would inspect and cull meat to send to the butchers, the meat my other grandfather would feed to his kids. The meat got to Chicago as cattle on the trains, which road the rails so much improved by Bessemer’s process. My uncle (grampa #1’s son) was a butcher who cut up the meat, and the abundance of meat brought down prices and grew strong people with good solid brains. God bless Henry Bessemer where ever you are! The Chicago stock yards are what peaked my interest in commodities trading. There’s gold in them there pens! What this is, is a description of creative destruction. Creative destruction is the motor that drives stock price. It’s productivity and innovation and a relentless improvement in efficiency. It destroys the inefficient and creates the efficient. It’s a concept born of economist Joseph Schumpterer of the Austrian school which uses Marx’s dialectic as the motor. In Marx’s theory production was static and money flowed from have not’s to haves causing what he thought would be social unrest to the extent the proletariat would rise up and smote their bourgeoisie overlords and usher in utopia. Marx lived in the fossilized society of London and his mistake was misunderstanding human ingenuity and creativity. The sucker was stuck in the mud without the creativity to understand he was in the belly of a fossil not something alive and growing. Unfortunately tens of millions died and lived in abject poverty over his stupidity. Not creative destruction but pure destruction and quenching of the human spirit. Production is not static so the pie can grow! Not only can the pie grow but you can bake a bigger better pie or a dozen bigger pies! What Schumpterer saw was the real dialectic is between creation and stagnation. The creative dynamo would rise up and pulverize the fossil. The creative dynamo would rise up, eat the fossils lunch and multiply the loaves and fishes (increasing value). The real dialectic was Bessemer’s efficiency of the new steel v the inefficiency of cast iron. The pie expanded and trillions were created out of thin air, and the opportunity flowed to my Grandfathers who each in their own way were able to feed their children, and their children had children. Creative destruction of course predated Schumptlerer he just normalized an understanding. It’s creative destruction, improving efficiency and productivity that is the motor in stocks. That’s were the excess value comes from. Unlike a bond which is pretty much a fixed legal contract creative is a living thing where something is made from nothing. I’ve decided on a Roth conversion schedule. $250,000, $250,000, $250,000, $250,000 for a total of 1M over 4 years. I’m in process now and I have till Dec 31 to get the first conversion done. This process has turned out to be more complicated than I thought but once understood very do-able. This schedule does not eliminate some of the cliffs of conversion like excess medicare costs but minimizes them over 4 years. Volatility of tax law. Since the present tax law expires and the politicos seem hell bent on changing the law again it’s time to make hay while the sun shines. This is why the first conversion are $250K. No matter what that much will be converted and likely no matter what $750K will be converted before anything could legislatively be done to ruin the plan. What could ruin the plan you ask? They could eliminate the ability to convert. Hopefully gridlock will protect me on all 4 conversions. By sticking to $250K, as a couple we avoid the extra 3.8% medicare surcharge, but still get 1M converted in 4 years. “John Doe, a 30% taxpayer, has a Traditional IRA worth $200,000 on Dec. 31, 2018, of which $100,000 is non-deductible contributions. Doe wants to convert $100,000 of this IRA to Roth. Because Doe has $100,000 of non-deductible contributions in this Traditional IRA, you would think that he could convert the $100,000 of non-deductible contributions tax-free. Unfortunately, the IRS has a special formula that must be followed if you own an IRA with normal contributions. That percentage is set each year based on contribution amount, total IRA size and total amount of non deductible assets in the IRA, for each spouse, once IRA conversion commences. Because my early IRA contribution was small when I started my percentage is small, about 2%. When I started the IRS only allowed 2K per year per spouse. So I will have to pay on 98%. 2% off works for me! My wife however worked a shorter time and raised our kids as a SAHM so her IRA is much smaller so her % tax relief is much larger, about 9% meaning on every dollar converted she pays, only 91 cents are taxed. Such a deal! The 1M conversion is not just my conversion it is OUR conversion but the IRA belong to each of us separately so sequencing the conversions into each spouses Roth accounts matters. It turns out by converting her entire IRA and by back-filling the remaining from my IRA to reach $250K total we save an additional $4000 in taxes. So my sequence becomes: convert all of hers then begin to convert mine for a $4000 maximized savings on this years conversion. I will recalculate next year on a conversion based on my IRA alone. 3. What you convert matters. You want to convert your highest risk assets first and of those high risk assets convert the ones that are down first. My TIRA’s are at Fido and Vanguard as are my wife’s and our Roth’s are there as well. Fido and Vanguard will transfer assets from a IRA to a Roth without a conversion to cash step as long as both IRA and Roth are at their brokerage. So the funds are transferred and a tax bill generated, slick! This year Emerging markets and Foreign are down 11% and 9% so these are my first equity’s to convert. Stocks are property and by transferring the least appreciated highest risk property first you can transfer the most property for the least tax bite. My conversion order will then be remaining stock, then alternatives, then REIT, then commodities, and finally bonds. My goal is to end up with most of my bonds still in the TIRA and not in the Roth. This minimizes the tax bill. A Roth’s greatest advantage is sheltering capital appreciation as in stocks. It’s less effective in sheltering assets that don’t appreciate much as in bonds. The trade off is pay the government now or pay the government later. Assets with large appreciation potential should be in the Roth ASAP so they can compound over years tax free. Something like bonds which don’t appreciate much can be RMD’d as an interest bearing annuity, and pay those taxes over time. BIG NOTE the RMD is still subject to whatever percentage you determine yearly from the non deductible portion when you started conversion so in my case if I RMD $30K I pay on only $29,400 since my percentage is reduced by 2% or so (variable each year). I’ll take $600 tax free, so it gives me a little Roth like relief even while being a TIRA. By splitting my assets into TIRA and Roth based on capital appreciation I split my tax bill between paying some now on the aggressive earners with no further tax consequence, and paying some in the future on smaller less aggressive earners as opposed to paying it all at once. This reduces sequence of return risk early in retirement to some extent. I am paying my taxes from my post tax account so by having a smaller tax bill for conversion that extra tax money I would pay by converting everything continues to grow in the post tax account. My goal at RMD is to live on SS + a small RMD which gives me room to grow for quite a while before a jump to a new tax bracket, supplement my income as needed from small donations from my taxable account and let the Roth grow unmolested forever. 4. By cleaning appreciation out of the IRA you have the ability to control tax brackets for a longer time. My SS will be about $43K and my wife’s will be about $10K for a total of $53K. Taxes are paid on 85% of the $53K or $45K. The top of the 12% bracket including deductions for age 65+ is 104,000 (26,600 deduction plus 77,400 (top end 12% bracket), so I have $59K of RMD money I can use to fill to the top of the 12% bracket. If I RMD say $25K my taxable is 45K + 25K or 70K and I have $34K of growth before I hit the next tax bracket. That probably is 12-15 years of retirement. Because of the .85% break on SS my spendable income will be 53K+25K or $78K. I’ll fill in my remaining needs from selling post tax stock or from post tax dividends. Since I’m in the 12% bracket cap gains are 0%. A masterpiece in optimization! (I think). I’ve run it by my professional adviser and he thinks so also. Just a snapshot of what post retirement granularity including Roth conversion looks like. So much for 4% x25, get drunk on the beach. You can’t control the future but you can control the likely shape of the future. In fact the whole 4 x25 rule is based on this, that somehow the future will look like the past. You only need a subset of the future to look like the past. You need the future to look like the past long enough for your plan to work until you become a carbon donor. Ever notice Curling? In Curling some joker throws a stone down a path of ice towards a bulls eye. Two other jokers have brooms and they slide along with the stone and sweep the way so the stone hits it’s mark. Victory has some component of luck but mostly application of doing what you can do to realize the result, aka risk control. The path of how this ballet plays out is not just accepting chance, but it’s encased in constantly changing the odds. I’m sure much drinking is involved as well perhaps changing the odds in another direction. Poker is the same. In black jack the house has an 8% advantage. The advantage is due to the fact the house bets last so the player goes bust first. By correctly playing the player can reduce the houses odds to 0.2%, still a loser for the player but barely. The odds change because as cards are played, what’s left in the deck determines new odds with each hand and the fact the house has to live by betting rules. By understanding those changing odds and by judicious betting 0.2% negative goes positive and the player takes the advantage. If you get too good the house won’t play with you. So retirement is not just abandoning yourself to chance but careful adherence to sweeping the path and correctly playing your cards and correctly betting, EVERY SINGLE THROW OR EVERY SINGLE HAND. The future plays out minute by minute not as an aggregate. Minute by minute is called accounting for sequence of return risk, aggregate is a future value calculator. People have trouble pulling the trigger because they are extremely risk averse. Their brains are wired that way. Your employer takes on the cost of your risk when he hires you. He pays for insurance, half your SS, makes sure all the government forms are filed on time, provides some retirement incentive etc. When you quit, all that risk cost comes back on you. If you have a plan that has dealt with the risk your pretty golden, if you have a plan that is based on some dumb assed formula you read on the internet.. ”At some point, we just have to decide that everything will be alright.” There is truth in that, but the truth is not inevitable and maybe not even probable. I was playing with this the other day and I decided the formula should be a payout say 100K per year + a risk premium say 20K per year, for 120K per year and save x25 of that number. 3M instead of 2.5M. That would give you living expense plus risk premium expense. This is why people like 3 x33 because that just about equals living plus risk premium. You also have to include taxes based on yearly payouts and filing status etc. Sweep the ice! I’ve read story after story about how to FIRE. The formula always starts with “SAVE HALF” or some similar bromide. What does save half really mean beyond the obvious application of third grade math? I was reading an article stating: “Whopping 62 percent of jobs don’t support middle-class life after accounting for cost of living” I’ve seen it proclaimed by some FIRE bloggers as if anyone can do this FIRE thing, with a bit of a sneer implying “and if you don’t you’re a dope”. To save half, means you have to make twice! Middle class is defined in the article as wages between $44K and $79K. Professional class is $79K or more. This means to save half and remain even in the low end of middle class ($44K) you have to be professional class ($88K). On the high end of the range to save half you must make nearly $160K per year. An entry level engineer makes $84K in NYC, $59K in Chicago. Save half kind of implies you have no debt after say 5.5 years of engineering school. But wait it’s even worse! It turns out depending on where you live you may be under water even on $44K. Honolulu has a starting middle class wage of $66K and if you apply the same middle class spread the upper limit would be $118K meaning save half would require remuneration between $132K and $236K per year. You might say OK Mr. Smarty Pants, we’ll save 1/4 and work longer! Yes precisely, you will work 9 years longer. Saving half of $88K @5% for 15 years gets you $1M. Saving 1/4 of 88K for 24 years gets you the same 1M. A common scheme I have read espoused by some bloggers is all you need is 15% savings yearly. 15% of $88K is $13K. That pays you 1M in 32 years. I guess if you can land a $88K/yr job at 22 you can retire on almost $44K/yr at age 54 assuming you never get fired or laid off, and live in a cheap place. Does the parlance of a 32 year career fit the fantasy definition of RE? What is the true longevity of $1M at a 4% withdrawal? At 54 you have 11 years to Medicare. At 4% withdrawal ($40K/yr) would put your retirement 10% less than middle class ($44k). You officially get to retire poor. OK Mr Smarty Pants, we’ll work longer! Why yes, yes you will. In the past decade we have had unusual market stability, artificially induced by the FED and the regime of stress testing of banks. In my opinion we narrowly avoided a depression in 2008. We are off the gold standard since largely since the great depression and that allows the government to print money. Also the FED bought toxic debt and returned treasuries which allowed banks to not go out of business. The problem is if the debt had been called in 2008, banks would have imploded. By moving the toxic debt to the FED balance sheet, it was allowed to mature and as it matured it became at least somewhat profitable. Like healing a wound add protein vitamin C, zinc, and time. By forcing bond returns low people moved out the risk curve and bought stocks, a lot of stocks. The forced stability of the FED on the market gave the illusion of safety. The economy is strong enough for the FED to unwind it’s balance sheet. Both bonds and stocks have have moved far off their historic mean trend lines. With the termination of FED interference both stocks and bonds will tend toward the mean, and the name of that game is increased volatility. Bonds are starting to yield enough return that their inherent safety plus a little dab of yield starts to look attractive in the face of turmoil. Stocks are inherently risky. You think something like SPY is pretty safe but did you know SPY tracks only a little over 300 stocks not 500 and it has a large cap tilt. VTI is even worse. It’s not 3000+ stocks but about 1500. I always wondered what would happen in a crash. If you own SPY and they are forced to sell, SPY would likely no longer track the S&P because the momentum of the selling pressure on the 300 SPY stocks would overshooting would overwhelm the tracking of the instrument. So your 15% volatility might be greater and increased vol means bigger losses compared to the real S&P or total market index. Who knows? A LOT of people own SPY and VTI and a huge heard of sellers is an enormous pressure on price. Controlling volatility is important in a portfolio, as important as return IMHO. High return is your friend in expansion but low vol is your friend in a crash. Lets say you own SPY. It’s projected return is 9.23% and it’s risk is 14.8%. Lets say you own a million bucks worth. Let’s say the market drops in half and my concern about increased vol doesn’t happen. So your 1M turns into 500K, a 50% loss. This means to recover to zero you need to make 100% before you reach your pre-loss level. When you reach your pre-loss level you start compounding again and making money. Till then you’re merely recovering. That recoup can take a long time. Here is a chart of SPY you can see the local max was on 10/8/2007. It closed at $155.85 That number was not seen again till 3/11/2013. That means for almost 6 years your money was sitting there under water. After 3/11 you started accumulating and compounding again. It’s Halloween, you want even scarier? This is the same SPY dating back to 8/28/2000. Notice it takes till 2007 to recover from 2000 and almost immediately another crash. This means nearly 13 years of living under water. If you’re going to make your million bucks with this sequence you’re going to have a tough time. This is what you made over those 13 years with a SPY account, 2.246%/yr and that was from reinvested dividends. Say you retired in Dec 1999, with the intention of living off the dividend. Your net growth/yr over the first 13 years of your retirement is 0.343%/yr. Freaky eh! Imagine you had some bonds say 60/40 SPY VBMFX. Your return is 7.41% and your risk is 8.93%. Lets say SPY drops in half. since your not 14.8% risked but only 8.93% risked (60% of SPY’s risk) your S&P will go down only 30% (1/2 of 60%) instead of 50%. Your 1M would only drop to 700K not 500k. That means you only have to get 60% back not 100% as in the first example. You would get your 60% back about 2 years sooner and start compounding again, while portfolio #1 is still under water. If you did that twice say in the 2000-2013 case that would be an extra 4 years of compounding portfolio #1 misses out on. For sure once portfolio #1 starts to grow again it will grow faster but the return rate on #1 is 9.23% while the return on #2 is 7.41% only 1.8% more. Eventually #1 will overtake unless there is a bad SOR as in the 2000-2013 sequence. What happens if yet another crash?. The sequence repeats. Let’s look at the 40/60 case. 40/60 has an expected return of 6.53% and a risk of 6.24% (only 42% of SPY’s risk). Now when SPY goes down 50% 40/60 goes down only 21% (1/2 of 42%). Your million becomes 790K. Your recovery to compounding again only needs to go up 42% as opposed to 100%. This portfolio has the shortest recovery time of all. 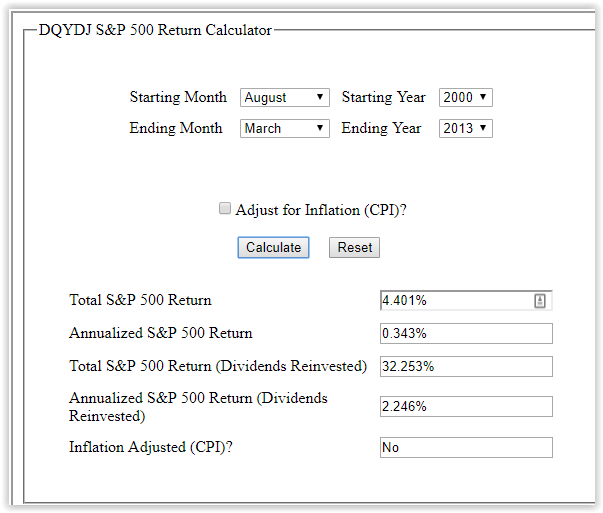 Your portfolio is still compounding at 6.53% only 2.7% less return than the riskier portfolio. Just because you pulled some asset allocation out of thin air does not mean you are wedded to that forever. It’s not all or none. You don’t have to go completely flat, you merely have to reduce your risk for a while by using a less aggressive allocation. You can turn down the volume a bit, you don’t have to shut things off. In addition you can use that 60% bond money when stocks are cheap to buy a passel and be “loaded for bull” on the way back up. Investing is like playing poker. The house is slated to win by 8% but by playing correctly you can reduce those odds to almost parity to -0.2%(aka change asset allocation in a down turn). You can further change the odds by buying low so you can sell high and let compounding work its magic. How to know when to hold em and when to fold em is problematic. I use a financial adviser and quant analysis and I’m happy to pay for that. That’s my strategy. If the guy gives me an extra 5 years of compounding during accumulation… you do the math. This article is an outline of a concept, a different way of looking at a portfolio from a perspective of capital preservation. It is not a plan. I do have a specific plan for my situation, but it’s more involved than this article would pretend. If our interested it gives you a starting vantage point to begin your study. The bogglehead approach is to simply stand there and take it with the refrain “I’m young I can recover! !” Problem is the young get old and the time to recover vanishes into the mist of mistakes made. Compounding takes time. If it’s a good sequence it pays off. But another way to look at compounding is mistakes take just as much time to compound into failure. This also points out a problem with FIRE. Compounding relies on time. You can wet start your portfolio by over funding. HUH? Over funding? It means you save half for 10 years instead of say 15% for 20 years. Nothing wrong with that right? What about mistake compounding? That mistake is merrily compounding but is overshadowed by your exuberant saving profile. It will manifest in it’s allotted 30 year time frame because it may take a long time for a mistake to become significant, (Example national debt. We ignore it continues to grow). Let’s say you overfund save a lot of money but make a mistake (say running a portolio at 90/10 AA) that mistake manifests in 30 years but you retire in 15 years. It means 15 years into retirement an over exuberant asset allocation takes its toll. Big ERN wrote a series here and here , looking at oscillating your risk profile risk and what he uses as red flags to know when to pull the trigger. A second point of reference. Fully retired 60+ Anesthesiologist living a no side gig kind of life. I’m interested in finance, religion, engaging the future as it becomes present, science, engineering, biophysics, neuroscience, medicine, physiology, family, and hearing other points of view. My approach to accumulation was not Bogglehead, but far richer in experience. My approach to retirement continues to be not Bogglehead. Bogglehead is starkly black and white, un-creative and lacks clear risk management. My world is colored! Retirement is not like accumulation. I’m done with the slavery of accumulation. My interest now is proper portfolio deflation. To die rich? Who cares? To not die poor? That’s the ticket! This site is for expressing my opinions and engaging in friendly discussion and does not constitute any kind of financial advice. If you use an idea it’s at your own risk as I offer no warranty or guarantee.